SKU: Dart Conex Complements 050PC 0.5 oz. 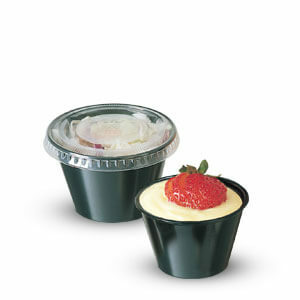 Translucent Plastic Souffle / Portion Cup - 125/Pack. Categories: DART, MEDICINE / PORTION / SOUFFLE CUPS & LIDS, PLASTIC CUPS / LIDS. Conex Complements Polypropylene Portion Containers Conex Complements® portion containers provide the perfect portion for any purpose. Made of durable, crack-resistant polypropylene, they’re ideal for the many diverse dining and carryout applications in today’s foodservice market. For dining, Conex Complements portion containers can serve anything from small side dishes to salad dressing and whipped butter. 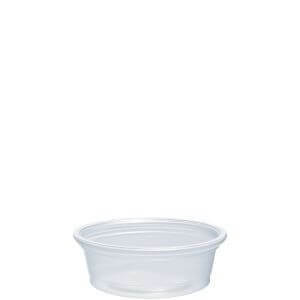 For carryout, when coupled with a secure fitting clear lid, they safely transport side sauces such as ranch dressing, marinara, salsa, and more.